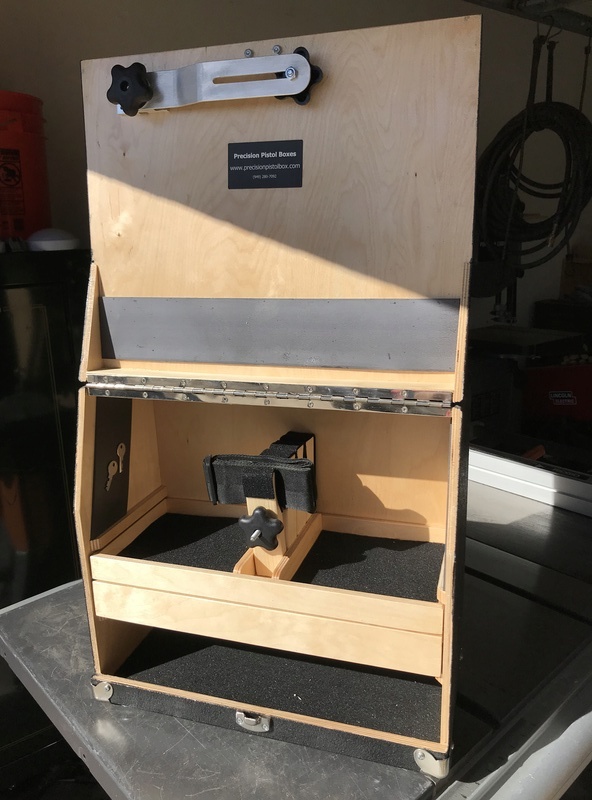 3-Gun Super Standard box. Never used. Briefcase-style non-recessed handle. 18” wide x 16” tall x 7 1/2” deep. 1 1/2” tall drawer beneath gun drawer. Jones Mount set up for right handed shooter. Carrying strap and hardware included and installed. $225 including shipping to Cont. U.S. I love the drawer under drawer idea! ...hmmm new addition? Nah. All Super Deluxes have a drawer. This was a custom that someone ordered, but never paid. Greg Walloch wrote: Nah. All Super Deluxes have a drawer. This was a custom that someone ordered, but never paid. Don't you just love when people do that!? I like mine! If I needed another I’d buy this one! It doesn’t bother me when folks back out of an order. Boxes are expensive, and life gets in the way of shooting, so I understand. Yes. These boxes can take guns up to 8 3/4” tall. Okay, I'll take it if it's still available. It sold several days ago. The “SPF” means, “Sold, Pending Funds.” Sorry. I have others coming.